Last week I wrote up a visit to the Lagunitas Taproom, the first stop on a day trip out of the city on a recent trip to San Francisco. 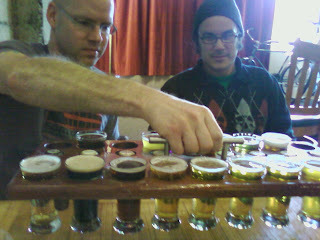 With Andy at the wheel and Dave and I drinking at pubs and snoring in the car, we headed north from Lagunitas to Russian River's pub in Santa Rosa, and then Bear Republic's pub in Healdsburg. Russian River was fun: it wasn't wine-country fancy as I had feared, rather it was a spacious, kid-friendly place that would fit right in if it were suddenly dropped into Portland. The food was pretty standard pub grub, and not surprisingly there was a fabulous selection of RR beers -- 15 on tap the day we were there. The beers were very reasonably priced -- especially for California -- West Coast ales were $4.50 a pint, and the Belgian "-tion" beers ranged from $3.75 to $6.75 a snifter. Whether you're going for the hop monsters like Pliny the Elder or Blind Pig, or for the sours like Consecration and Sanctification, you'll be pleased. Go visit if you're anywhere nearby. About a half hour north of Santa Rosa is the little resort town of Healdsburg. 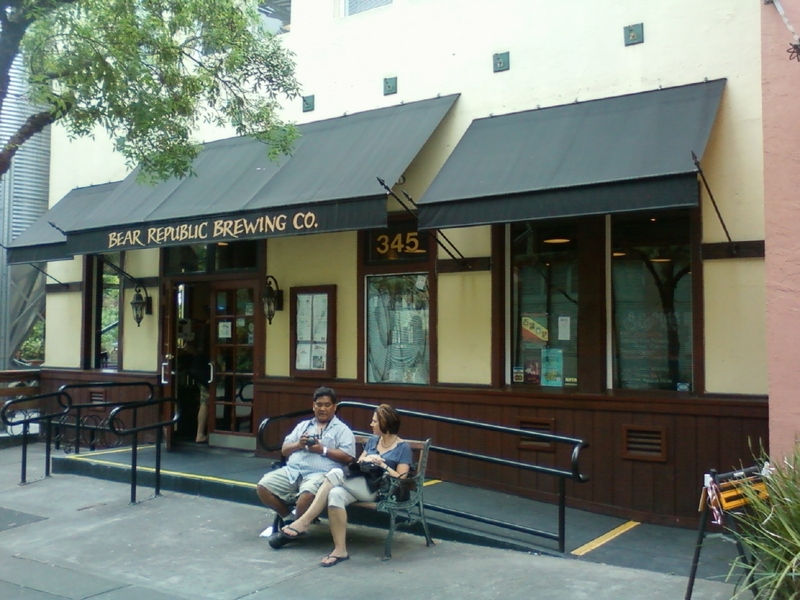 Tucked behind the tourist-shopping main drag is a Bear Republic pub, which we thought we'd try, since we like quite a few of their beers, like Red Rocket and Racers 5 and X. As near as we could tell, no actual brewing happens at the pub, but they plunked a bunch of big tanks down here and there to give it a brewy feel. 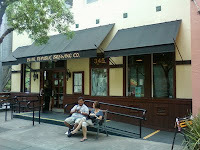 The place was a little bit of a letdown, partly because the Bear Republic meet-the-brewer at Apex in Portland a couple weeks ago had a much more amazing selection of their beers than the pub did, and partly because Russian River and Lagunitas were much more our style. The thing that made the biggest impression on me was that a lot of people at the Healdsburg pub were drinking from German-style 1-liter mugs. If for some reason you are being punished with an overnight stay in Healdsburg, those would be just the ticket for drowning your sorrows. But I wouldn't recommend going out of your way for a visit. Neither the town nor the Bear Republic pub offers much to get excited about. Might want to try tasting some of the wines from the Healdsberg, Alexander Valley and Russian River area next time. While RR has some wonderful Beligian type beers, the true treasure are the vineyards of the area. Very cool. I hope to get down there soon! And yes, the vineyards down there are awesome, and you don't have to spend a lot of money! I often buy very inexpensive pinots from the area, and they are often some of the best. But we are talking beer here.